← How did post-truth happen? That’s right. On the day Paul Keating told the ABC they are letting Australians down, and on the day climate scientists warned uncontrolled climate change has pushed the Antarctic to a world-altering tipping point, Australian news organisations, who often complain that they no longer have the resources they need to go out and find stories, found enough resources to follow Pauline Hanson and her fellow One Nation climate deniers on a fun little day-trip to far north Queensland, to capture her swimming in a healthy part of the reef and to beam her climate change denying message to a national audience. I know ABC weren’t the only ones there, but I’m focusing on them because they should know better. I’m focusing on them because they covered this non-story not just on the evening news, but also gave it a full ten minutes on apparently-current affairs show 7:30. Why on earth would any so-called-credible news organisation do such a thing? The answer to that is simple. Pauline Hanson is colourful and therefore newsworthy. When she says ‘I’ve got something to say’, the Australian media don’t expect her to earn the right to say it, on a national television screen. Instead, they follow along like lost puppies, giving her all the free publicity she could ever ask for, falling for her simple yet effective media strategy hook-line-wetsuit-wearing-and-sinker. This simple strategy goes like this: the more ridiculous the comment, the more publicity it gets. We could call it the Hanson media strategy. Or the James Ashby, Hanson’s chief strategist’s media strategy. But that would be a bit inward looking. A bit, you might even call it, xenophobic. Because really, this strategy is not unique to Hanson. It’s not even unique to any of the One Nation nut-jobs (yes, I will call a spade a spade), or Cory Bernardi, or George Christensen, Eric Abetz, Peter Dutton or any other brought-to-you-by-the IPA or the HR Nicholls Society, or the Australian Christian Lobby or any other shady-funded-by-who-exactly-we’re-never-told shock-jock political-operatives. No, this strategy is global and it worked so well for the Trump-circus and the Farage-circus, it’s more than likely going to be adopted by political communicators the world over. Why not, when the media is so happy to oblige, and it works so well? What was the point of Hanson’s reef visit? Journalists surely don’t think it’s newsworthy that she’s a climate change denier. 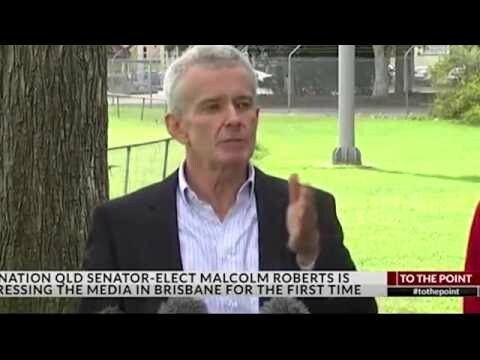 We all know One-Nation Senator Malcolm Roberts was involved in the running of the Australian Galileo Movement who have been at the forefront of fighting against climate action in Australia for as long as there has been such a movement. It’s not newsworthy that there are still politicians out there who deny science, who deny experts, who deny that the world needs to do something about climate change before it’s too late. None of that is news. The angle Hanson was going for was that she was defending the Queensland tourism industry from falling tourist numbers, which are caused by, she claims, the false publicity that the Great Barrier Reef is being damaged from climate change, when really, she claims, the reef is fine. There is no logic here. There is no rational way in which a journalist can accept this clearly ridiculous argument with a straight face. And the key point is, there is no way this attitude, this media stunt is deserving of an audience. There are not two-sides-to-the-climate-change-argument because it’s not an argument. If I called a press conference to claim the sky is red, would I get 10 minutes on 730? No? By putting Hanson’s climate denial on our TV screens, and by not even trying to frame it as ridiculous, as un-thinking, as populism-against-experts-against-people-who-are-trying-to-save-the-reef, against the so-called-elite, a term now given to anyone who has the ability to think critically, the media is letting their audience down. There is a phrase in public relations speak called ‘earned media’. Earned media is the opposite of paid media, the idea being that PR people lobby journalists to cover their stories by positioning those stories as newsworthy and as credible and as important to the audience, so that the space in the news section is earned, rather than paying for the message in the advertising section. My question to the ABC is this: what did Pauline Hanson do to earn all the free publicity she got on the ABC news and 730 last night? I often hear the argument that Pauline Hanson received enough votes to get herself elected to parliament and that’s all she had to do to earn a right to a media pack following her around. But do all elected members of parliament get as much attention as Hanson? Do they all automatically have the right to say whatever they want, without fact-checking, without question, without having to come up with something that’s newsworthy, important, factual, credible and correct? Do they have to earn the right to be on the news, or can they say whatever they like and it will just be repeated, maybe fact-checked at a later stage on a different medium, but too late then because everyone has already seen the climate change denial and this is the only message they remember? The media is letting us down alright, and it’s helping the likes of Hanson win more votes, scrutiny free. Until news producers are willing to turn down Hanson’s invite to the reef, until they are willing to follow her on her merry-little-publicity-seeking jaunts only under the condition that a climate scientists accompanies them to refute her anti-fact-statements right there on the spot, as part of the same news story, to show that she’s really got zero clue about science, and to put her off trying anything like that again, then they’re letting us down. Until we stand up and say enough is enough, there’s no reason they’ll stop playing this game. ABC complaints can be lodged here. I am inclined to believe the MSM follows her around the better. Exposure can work 2 ways. Truth is neither her or fellow MPs have anything of worth to say. The only thing I demand that MSM do their job and hold them to account. Hold them to account? Good luck with that one. Most journalists wouldn’t understand what you’re talking about, let alone ask any difficult questions. We can, as we do here and elsewhere. How would a fish n chip lady know anything scientific especially one without average intelligence? Got to know at what temperature oil boils. That’s physics. Got to know how much change to give the punters out of a 50 buck note. That’s mathematics. Got to know how long you can store fish and tatties before they go off. That’s, er, well, biology and plant science, I guess. Highly scientific occupation, being a fish n chip lady. Maybe that’s why she gave it the flick and went for a much simpler profession where you can live very well off the public teat and don’t need to know sod-all about that danged book-learnin’ caper. It’s really a great shame that someone didn’t put just a little too much ballast weights in their wet suits…………………………..